Home / Scrollsaw Patterns / Clocks Scrollsaw Woodworking Patterns / Architectural Clock Woodworking Plan. 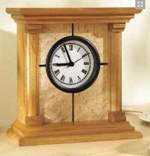 31-MD-00285 - Architectural Clock Woodworking Plan. This clock design is accented with basic edge profiles and a four-segmented birds-eye maple face. It has just eight parts and no complex joinery. Stately yet simple, this architectural clock can be built with just a a few tools. We used birds eye maple and cherry, but you can use a wood of your choice. A full materials and supplies list is included with the plan. Tablesaw, bandsaw, or jigsaw, router, clamps, and common hand tools. Arched Top Clock with Drawers Woodworking Plan. Arts and Crafts Mantle Clock II Woodworking Plan.